I spent a good part of the day working stations in the ARRL RTTY Roundup. I decided to use “classic” RTTY, rather than one of the new modes (FT8, PSK31, etc). I had to fiddle a while to get all the software working together, but nothing serious. I used Win4Icom, my IC-7300, FLDIGI, and N1MM+ Logger. It all played well together. I was running about 30 watts power out. I had tried to use a different RTTY engine before (MMTTY), but had a few issues with it. It worked … but I was less than impressed with some aspects of it and that’s what led me to try FLDIGI. 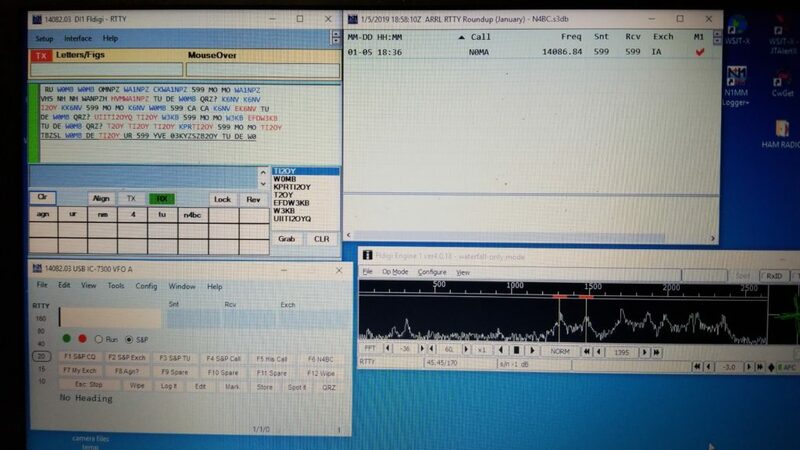 I operated AFSK (Audio Frequency Shift Keying), using the sound card in the IC-7300 and the only little nag there, is my ALC was at about 50 percent on transmit. The manual says this is OK, but I’ve always tried to get it as close to zero as possible. I think there’s a way to use both the USB and CI-V cables to use FSK (Frequency Shift Keying). I’ll have to research that. The IC-7300 will do FSK in the RTTY mode, and there’s lots of memories for preprogramming contest messages, so I guess you could work a contest just sitting there reading the display and pressing buttons, but then you don’t get the integrated logging that N1MM+ gives you. Synergy, I think they call that! I probably would have continued on a bit more, but !!MAN!! — did that stint at the radio do a job on my lower back. I definitely know I’ve been sitting in a “not too comfortable” chair for a long time. I definitely need to take more frequent breaks and walk around a bit. So far, my stats are 75 QSOs and 2,625 points … only 3 DX QSOs … all the rest USA and Canada. Pretty pathetic, huh? Hey, don’t judge me … I’m playing radio! UPDATE: I ended up with 161 QSOs, 7 of which were DX stations, and 8,050 points. I had fun! Good vibrations … to quote the Beach Boys … RF vibrations, that is. Last night, I heard stations on just about all HF bands, some quite strong. I worked over a dozen FT8 stations on 40 and 60 meters. The higher frequencies, not so much luck. Although they were solid reception, I just couldn’t connect. Even 80 meters was reasonably devoid of QRN. I got my RTTY setup working. I was using the wrong mode on the IC-7300. I was set to RTTY and should have been in USB-D since I was using AFSK. At least, it seems to work now. I couldn’t find any RTTY stations on the air yesterday evening to do a final test. But … listening on another receiver, I can hear the diddle and mark/space tones when doing a test transmission.